This is a very famous horse book that tells the story of how the Morgan horse breed started in the US. It’s a great story about a special horse, Little Bub, who started out as a “runt” but went on to become a superstar. It’s a suspenseful story with tragedy and triumph. If someone wanted to make up an adventure story about a horse, they couldn’t make it more interesting than Little Bub’s true story! 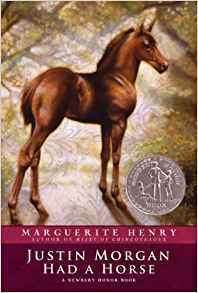 It’s written by Marguerite Henry, who also wrote Black Beauty. They also made a movie of this book. You'll find out how the Morgan horse breed got started, and you'll also find out how they got their name. I love the idea that a horse no one thought could do much of anything became so famous that everyone knows that breed now. It just goes to show you should never give up on a horse! My mom read this to me when I was younger, and I loved it. Some of the old fashioned language can be kind of hard to follow, but the story is great. If you love Morgan horses - or really horses at all - you’ll want to read Justin Morgan Had a Horse. Joel Goss knows that Little Bub is a special colt, even though he's a runt. And when schoolteacher Justin Morgan asks Joel to break the colt in, Joel is thrilled! Soon word about Little Bub has spread throughout the entire Northeast -- this spirited colt can pull heavier loads than a pair of oxen. And run faster than thoroughbreds! This is the story of the little runt who became the father of the world-famous breed of American horses -- the Morgan. This is the story of the foundation sire of the Morgan Horse Breed. SOO GOOD that you'll want to want more!!!!!!!!!!!!!!!!!! I read this book in school and it was totally awesome :) You should try it!